Santiago, a student from Venezuela, has been studying English at ECSF, an English Language School in San Francisco. 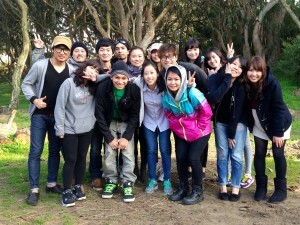 Recently he had a food adventure in Baker Beach with other EC students. Read about it here! A few weeks ago I went to Baker Beach to have a barbecue with some friends of the school. They thought it was a nice idea to eat and relax with some people so I decided to go. I live in the inner Richmond, it’s just 20 minutes from my house to get to the place so I was the first to arrive, most of my friends live in the downtown area and they decided to go to japan town first to get some food and drinks…Of course! A bbq without food is not very fun hahaha. If you want to chill and eat with some friends, Baker Beach is a very good option! The place is nice and it has an excellent view of the Golden Gate Bridge!